If you have curly hair, chances are your hair tends to be dry, coarse and brittle. It also tends to frizz up, doesn't it? Creamy shampoos - Creamy shampoos are a better bet than clarifying (or clear) shampoos. Two types of conditioners - You simply cannot over-condition frizzy hair. You need a heavy conditioner for use every time you wash your hair, and a deep conditioner for use once a week. Styling cream - Enhance your curls with a cream created for curly hair. Rub it in and let hair air dry. Style serum - Warm up a couple drops of this in your hands and palm over dry, frizzy curls. The serum will solve your frizz problems. Straightening balm or gel - If you want to blow-dry hair straight, rub a quarter-size amount of this on hair before drying curly hair. Put Away the Blow Dryer - To combat the frizzies, refrain from blowing hair dry. Adding heat to air only increases the problem. Instead, finger-comb hair, letting curls air-dry. 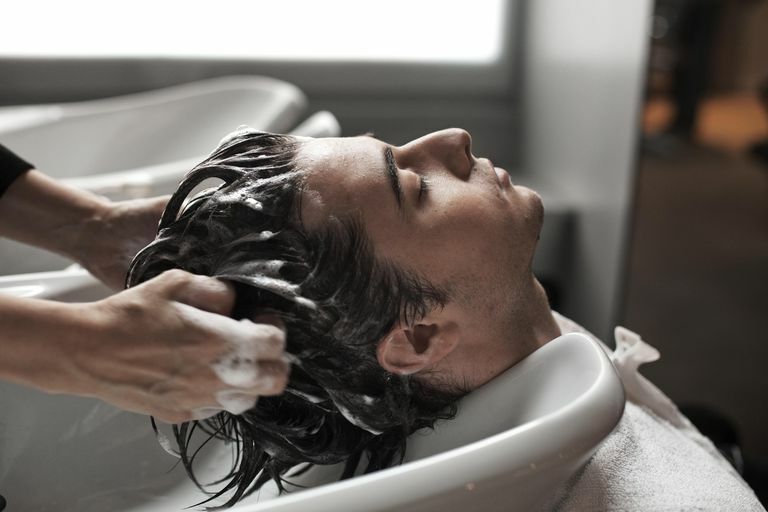 (Luckily, because your hair tends to be dry, so you don't need to wash hair more than a couple times a week). If you must use a blow dryer, use a diffuser and dry by cupping hair with your hands from below (never scrunch curls, you'll invite frizz). One tip we learned from a curly haired friend: Don't rub hair dry with a towel, instead squeeze moisture out with paper towels. The Less You Mess, the Better - The more you play with your curls whether its blow drying them, scrunching them, etc, the better chances you'll get frizz. You can style hair by twisting curls around your finger, letting them lay to air dry. Find a Good Stylist - My stylist had curly hair and she went to another stylist with curly hair to get her hair cut. Why? Because she knew this stylist understood her hair, her needs and how finicky curly hair can be. Not everyone agrees with me (some stylists insist anyone can cut curly hair), but I still stand firm.